So this is the first walk of the year, what I hope will be one of many. This walk was a suggestion of my wife’s, and I am very thankful of the suggestion and encouragement to climb it. 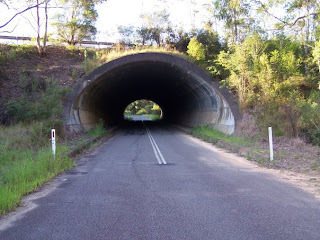 After work yesterday (21/1/10) I drove straight to Kangy Angy and parked near a road tunnel that goes under the F3 to the farm land. The F3 freeway is cutting into the mountains western side, Kangy Angy to the south, Westfield Tuggerah to the north and the pacific highway meanders itself around the mountain to the east. The 4km return walk starts off by heading up a steep and badly eroded road. I suspect this was the main road used to get to top in the past, but there is now a tarred road on their side of the hill that council and Telstra workers now use. The track soon meets a junction of tracks, some used for trail biking, horse riding and others that follow the powerlines over the mountain. There is another steep section, after that the track flattens out along the ridgeline passing some handmade stone walls. I'm not sure what they were used for and will endeavour to find out from the local historical society. This would have been one of the noisest walks I have done so far. From the noise of cars and trucks from both highways, freight trains to the noise of bell birds and cicadas. Oh well, just a reminder how close to civilisation I really was. 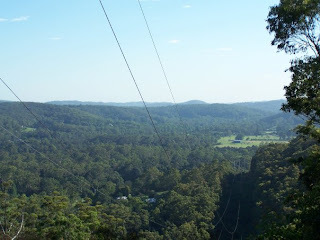 Just before the last steep bit, there is a nice vista to the south and north where the powerlines create a clearing in the bush. To the south the view is of the valley of Ourimbah and in the distance is Berry's head, Mount Mouat which is in Rumbalara above Gosford. 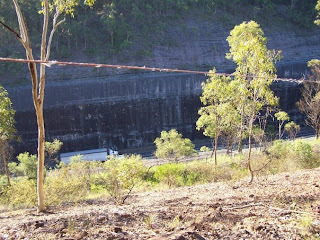 To the north directly below is the site of the old abattoirs, to the left Mardi dam, the F3 with the Watagans and Heatons Gap off in the distance. 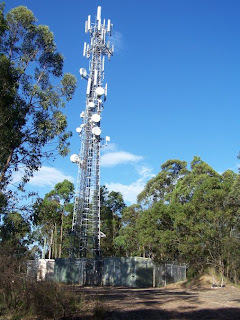 With just a half an hour of walking I have reached the elevation of 148 metres above sea level and the trig station on top the of the best sounding mountain I have climbed, Mt Tangy Dangy. 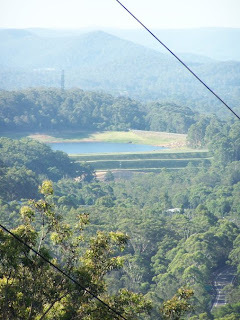 Here there is a Telstra communications tower. Not satisfied with the walk so far, I then headed down the steep and slippery sealed road, knowing that my legs would be hurting on the return trip back up the hill. 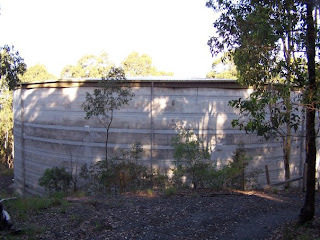 I passed a large water tank that helps supplies water for the local area. 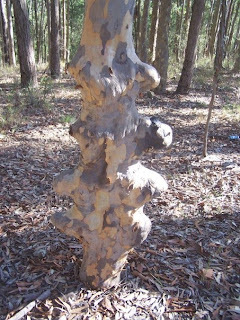 The road then goes through private property and comes out near Tuggerah primary school. I turned around at this point. 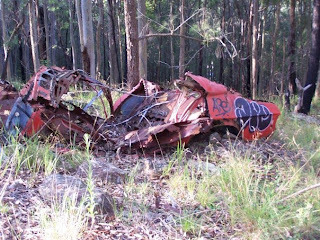 A kingswood, needs a bit of work to get it back on the road again. After reaching the top for the third time, I retraced my steeps down the hill and back to my car. The walk took one and half hours to complete. It was a nice walk after a day being stuck indoors. It would have been nicer if there wasn't some much damage caused by fellow humans.